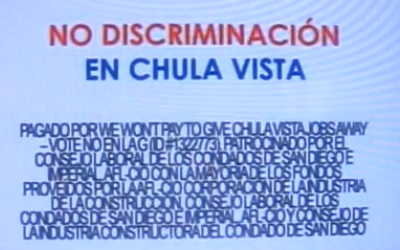 SAN DIEGO — Just when you thought you had seen it all, Lorena Gonzalez’ Labor Council hits a new low with a disgusting, race baiting ad on Spanish language television designed to scare voters into voting No on Proposition G in Chula Vista. 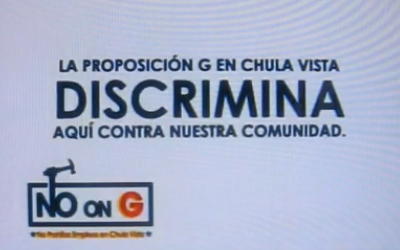 The ad claims that the Arizona law just passed will result in people getting arrested if they look like they’re from Mexico, and implies that Proposition G will bring that type of discrimination to Chula Vista, essentially tying the faulty assertion of the first with the equally faulty assertion of the other. “This is the worst kind of race baiting I’ve ever seen; worse than that of San Diego Council President Ben Hueso and SDUSD Board President Richard Barrera when they made similar erroneous claims about the new Arizona law recently. “Lorena Gonzalez has gone even further by implying that the passage of Proposition G will result in racial discrimination in Chula Vista. Shame on on her for twisting the truth in this dispicable and disgusting way to further her union agenda. “Proposition G is exactly the opposite of what her ad claims. It’s about fair and open competition, allowing ALL Chula Vistans to compete for constructions jobs, regardless of whether they have chosen to join a union or not. 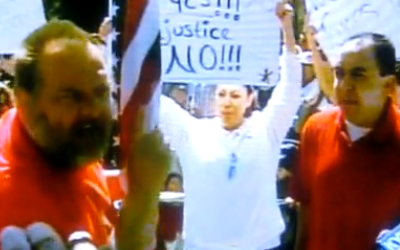 The new Arizona law discriminates against Latinos. The police can arrest you simply because you look like you’re from Mexico. Prop G in Chula Vista discriminates here against our community. Prop G will take away jobs from here in our community. Vote No on G. Defend our Community. No discrimination in Chula Vista. No on G. Do not prohibit jobs in Chula Vista June 8th. Paid for by We won’t pay to give Chula Vista Jobs away – Vote No on G (ID#1322773). Endorsed by San Diego and Imperial Counties Labor Council AFL-CIO with the majority of the funds provided by the AFL-CIO, Construction Industry Corporation, San Diego and Imperial Counties Labor Council AFL-CIO and San Diego County Construction Industry Council.